Three cheers for Hedgren and the Magical M crossover bag, the perfect way to celebrate 25 years of business! This beautiful bag features light gold hardware, including a convenient key chain, bright block colour and an eye-catching multi-colour shoulder strap that can be adjusted to fit. 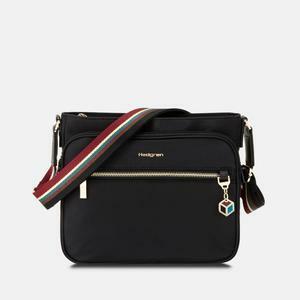 A bag that was made for extravagance and convenience, this is one not to miss! The lightweight design is not all about looks. As with all our bags, we’ve squeezed in as many pockets as possible, in order to keep you organized as you go about your day.